Updated May 14: The display panels from the April 22 open house are available on GO Transit’s website. Construction is already underway for the grade separation project at the West Toronto diamond, and the residents are mightly upset about the noise from pile driving. This project will continue disrupting the neighbourhood until late this year. 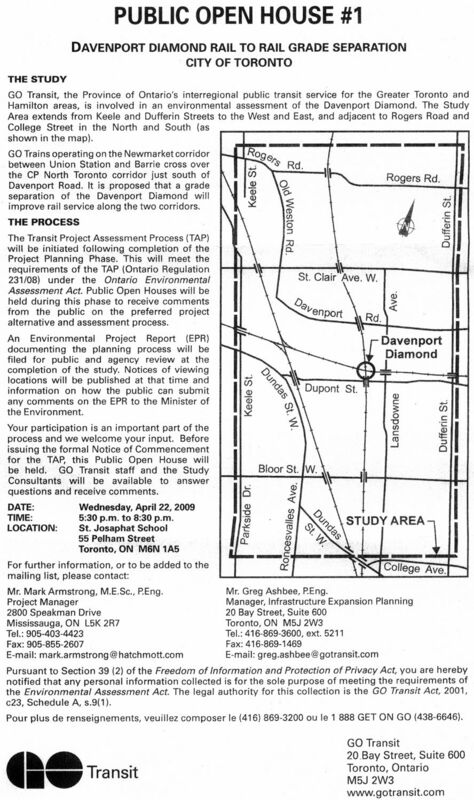 GO Transit has announced a public meeting on April 22, 2009 that will kick off another project in the same area, this time to remove the diamond where the Newmarket Subdivision (Barrie GO line) crosses the CPR North Toronto Subdivision. A few days ago, my travels took me to Parkdale for a presentation near Jameson Avenue in the early afternoon. The obvious route for someone like me living near Broadview Station was the King car. That journey gave several examples of how service can be delayed that have nothing to do with traffic congestion, and illustrate the changes that will be possible when the TTC moves to low-floor cars and all-door loading. Just south of Danforth, we picked up a load of students from Moncrest School on their way to Thomson Hall. They filled up the back half of the car. Just loading them all took a while, and I wondered to myself how the TTC will handle fare collection for this type of group when they move to self-service. Now we were slightly late. By the time we were westbound on King, the car was filling up. A man had boarded with a shopping buggy, and he took a single seat just ahead of the rear vestibule on the left side of the car. This started a plug in the aisle that worsened when a group of five boarded. There were not enough seats for all of them, and they wound up partly seated and partly standing right across the aisle from the shopping buggy. Needless to say they were not going to “move to the rear”. At Sherbourne, we passed up the first group of would-be customers even though there was still room in the rear vestibule. This continued at Jarvis, Church and Victoria. At Yonge, the crowd turned over, but the car was now quite late and we still didn’t manage to fully use the capacity. By University we were again leaving people at the stops. The students piled off the car at Simcoe, and by Spadina the car had cleared out reasonably. All the same, we left an unhappy customer running for the car at Bathurst because getting back on time was more important than waiting, and the next car was only a block behind us. While this may have been a particularly bad example of how service can be screwed up by loading delays, it’s not uncommon. The combined effect of many factors interferes with the travel time of TTC vehicles, and this has nothing to do with whether they are in a private right-of-way. Loading delays caused by inadequate service can cause a downward spiral where line capacity drops even as ridership grows because cars spend longer at stops and onboard crowding slows or blocks movement of passengers. We hear far too much about traffic congestion as the root of all evil. Yes, it exists, but it’s not the only problem.